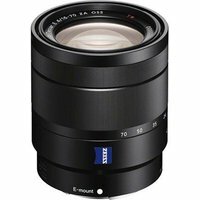 The Sony E16-70mm f/4 ZA OSS Lens is a high-performance Carl Zeiss lens designed for Sony's APS-C E-mount compact system cameras. This 4x zoom lens covers a focal length of 16-70mm (24-105mm in 35mm full-frame equivalent) is ideal for everyday shooting, including travel, landscapes and portraits. Built-in Optical SteadyShot reduces camera shake during handheld shooting and improves performance in low-light conditions. The constant f/4 maximum aperture enables you to use faster shutter speeds and capture sharp, clear images at a low ISO. The Zeiss T* anti-reflective lens coating is designed to ensure higher light transmission and minimise ghosting so that every detail and burst of colour is captured.